TURKANA, Kenya – The grandniece of archeologist Richard Leakey looked delighted. 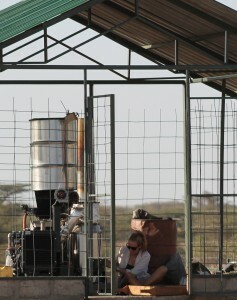 It had taken 19-year-old Acacia Leakey weeks to go through each complicated-looking inch of the experimental gasifier at the Turkana Basin Institute, but she was now confident that the source of an annoyingly elusive air leak had been mended. And she was ready to see if her handiwork had been successful. With the press of a large green button, the machine – a jumbled tower, taller than a man, of silver cylinders, black boxes and tubes – hummed to life. Leakey, who was working on the gasifier in her great-uncle’s absence, smiled cautiously as it began the process of turning doum palm nuts, a local food staple, into usable energy. “This is very exciting!” Leakey said, clapping her hands and giving a little jump. That satisfaction was short-lived. Minutes later, when Leakey turned the key that powered a car engine built into the gasifier, things started to go wrong. The gasifier is the most complicated of the three. Leakey said she was shocked when the engineer who installed the machine had to refer to a manual. If anything malfunctions or breaks in the dusty desert heat, replacements would come from the manufacturer in California, All Power Labs, at considerable expense and delay. Another challenge is making alterations to accommodate the organic matter the gasifier burns, said Dr. Devinder Mahajan, an expert in alternative energy at Stony Brook University and Brookhaven National Laboratory, and a big supporter of gasifier technology. TBI brought Mahajan to Turkana to advise them on their energy projects. “We are trying to utilize all the waste materials from the region,” he said. At TBI the organic matter, or feedstock, used in the gasifier is the pit of a doum palm nut. The nut grows on a doum palm as a coconut does on a coconut palm. The Turkana people eat the fibrous, gingerbread-flavored red-orange flesh or use it to make sweet flour. The inner pit is typically considered waste, but that is exactly the part of the nut the institute uses as gasifier fuel. But obtaining the doum palm pits for the machine became a daily drama for Acacia Leakey. The institute pays the Turkana five shillings, or six cents, per kilo of pits – a price the locals insist is too low. In the mornings, Leakey said, Turkana women would come to TBI with old fry-oil containers full of pits, each complaining of the hot weather, the long walk and the weight of all the pits they brought to sell. Then the bargaining ensued. If Leakey stood fast on her price, by day’s end she would typically have purchased about one and a half tons of pits for a whopping 6,803.90 shillings (about $78). At the nearby village of Loreng’elup, the institute is experimenting with another alternative fuel method: a biogas plant. Much simpler and requiring far less maintenance than the gasifier, it powers the lights and a stovetop at a maternity clinic that TBI built. For its feedstock, the plant uses goat dung, which is plentiful in Turkana. A clinic worker soaks the dung in water overnight in two halves of a blue plastic drum. The next day, he slides the wet pellets into a pipe that connects to a flexible bag about six yards long. Over several days, the plant silently produces methane gas that powers a small generator. Amazingly, the goat dung processor has no odor. The remaining solids make for good fertilizer, but gardening is an unfamiliar activity in this part of the Turkana region. In fact, the institute’s staff had intended to use the fertilizer in an experimental vegetable garden near the clinic. Acacia Leakey said the garden failed because no one tended it. On Leakey’s first visit to the biogas plant in several weeks, she was shocked by its condition. Dirty condoms and medical syringes lay scattered on the sandy ground around the plant. A $300 tarp that protected the plastic bladder from direct sun hung haphazardly, leaving one end flapping in the breeze. Hannes Muntingh, a Nairobi-based energy consultant whose company, Biogas Energy Solutions, installs biogas plants throughout Kenya, said he has reservations with biogas plants like the one at the maternity clinic. “They do not tend to last that long though they are more portable and less expensive,” he said, comparing the plant at the maternity clinic to the stone biogas plants his company prefers to install. The Journalism Without Walls program originally published this piece online here.